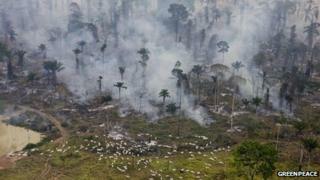 Image caption Farmers use fire to clear land for cattle, destroying huge swathes of rainforest in the Amazon region. The main group representing supermarkets in Brazil says it will no longer sell meat from cattle raised in the rainforest. The Brazilian Association of Supermarkets, which has 2,800 members, hopes the deal will cut down on the illegal use of rainforest for pasture. Deforestation in the Amazon has slowed over the past years but invasion of public land continues to be a problem. Huge swathes have been turned into land for pasture and soy plantations. The Brazilian Association of Supermarkets (Abras) signed the agreement with the Federal Public Prosecutor's office in the capital, Brasilia. Public Prosecutor Daniel Cesar Azeredo Avelino said consumers would benefit from the deal. "The agreement foresees a series of specific actions to inform the consumer about the origin of the meat both through the internet and at the supermarkets," he said. Mr Avelino said a more transparent labelling system would also make it easier for consumers to avoid buying meat from the Amazon and make it harder for shops to sell items from producers who flouted the law. He said he would now work towards reaching a similar deal with smaller shops. Under the deal, supermarkets have promised to reject meat from areas of the Amazon where illegal activities take place, such as illegal logging and invasion of public land, Mr Avelino said. There is currently no deadline for the implementation of the measures, but Mr Avelino said they would be adopted "soon". According to the pressure group Greenpeace, expansion of the cattle industry in the Amazon is the single biggest cause of deforestation in the region.